October | 2008 | Elger's Weblog! Last week i traveled between Arnhem Presikhaaf and Zutphen by train. Having nothing to do, i decided to start up kismac; an application that lists all wireless networks in the area. My findings are pretty nice. 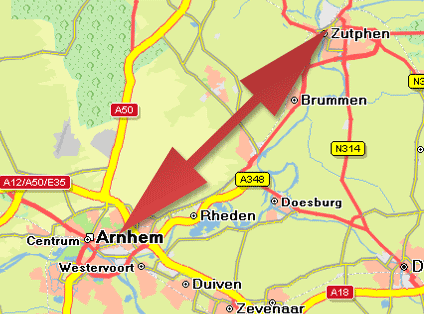 The distance between Arnhem Presikhaaf and Zutphen is about 30 kilometers; not that long. In this 30 kilometer i found 600 wireless access points. That is 20 access points per kilometer (half a mile). As you can see: large areas on the map areÂ uninhabited. When i’m just looking at a city the results are better: 153 access points in 5 kilometer. Unfortunately i didn’t have a GPS device enabled, otherwise i could pinpoint the distance between the access points moreÂ accurately. Not that it really matters while traveling by train. Also there might be access points that did not broadcast its SSID. The resulting log was exported from kismac to excel (via the netstumbler format). From there some nice statistics can be derived. First, we take on the issue of security. As the below graph shows: if you would live somewhere along the railroad between Zutphen and Presikhaaf, chances are you can connect to the internet for free. A total of 90 people did not secure their access point. 186 connections are ‘pretty secure’, mostly using theÂ deprecatedÂ WEP standard. The nice thing about wep is that you can hack it quickly and easily with the right toolset. 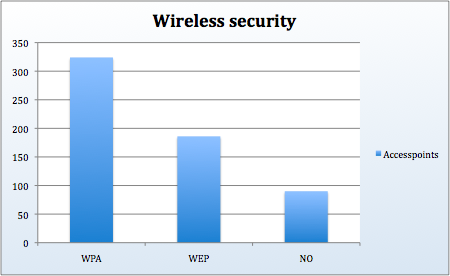 The best news is that most access points are using WAP. As expected, channels 1 6 and 11 are used. The original idea behind these channels was to reduce interference. I’m not sure how that works when there are at least 10 other access points in theÂ neighborhoodÂ using the same channel. Luckily there is some hope. The awesome number of _1_ is using channel 128. Personally i believe that there should be at least 1024 channels whereof 340 are actually used. Then you are sure the 20 accesspoint near you could be on a non-interfering frequency. 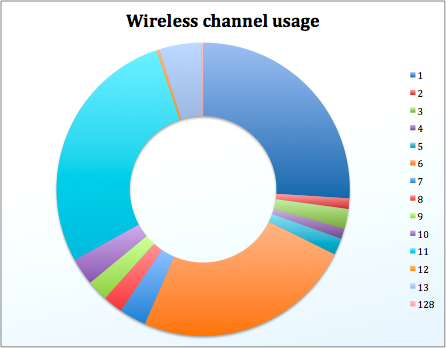 The stats image is somewhat misleading; it shows a clear division of all channels: 1, 6 and 11 are equally distributed. Of course this is coincidence. What is funny though is that an equal number people (compared per standard channel) is using a non-standard channel. To my surprise you can see what manufacturer has built the access point. This has to do with MAC registration numbers (which are AS:IG:NE d to different manufacturers). 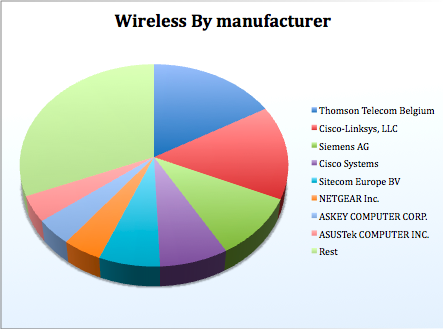 Its nice to see Cisco being listed twice; once for consumer and once for professional networks. Most of the profi networks i found use cisco. Most SSID’s are named SpeedTouch; people don’t like to setup something. The speedtouches are shipped by KPN. This entry was posted in t3h interw3bs!1 and tagged access, brand, channel, manufacturer, point, security, statistics, wireless on October 3, 2008 by elger.